LHU Meritorious Service Individual Award recipients. 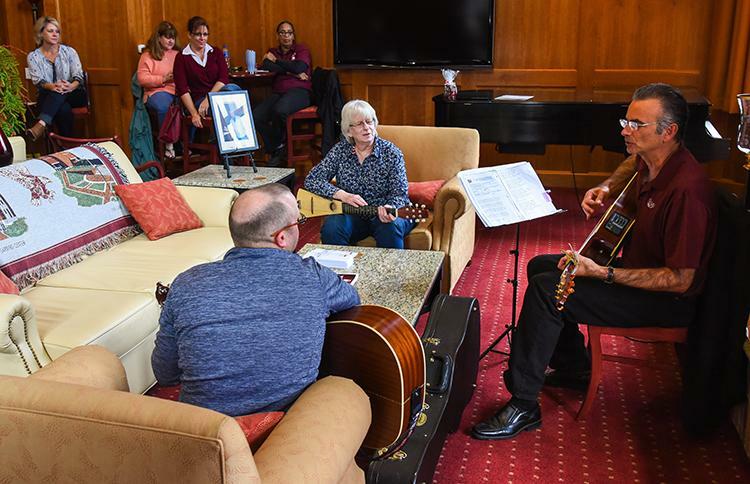 The day-long event was open to all staff and faculty and dedicated to providing LHU employees with an opportunity for professional and personal development. There were several events, workshops and presentations scheduled throughout the day that employees could participate in, including informative, educational and fun activities. The day began with coffee and snacks in the Parsons Union Building. 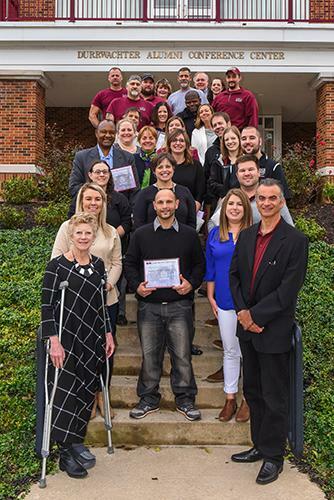 An employee recognition luncheon was held in the Durrwachter Alumni Conference Center at noon, where several individuals and teams were recognized with awards, as well as employees with significant years of service to the university. Meritorious Service Individual Award recipients were: Elizabeth Arnold, Ashley Koser, Patrick Guerriero, Joleen Karichner, Patrick Long, Denise Rupert, Kathy Trate, Suzanne Beach-Kunes, Holly Evans, Thomas Keiffer, Sherry Moore and Amy Downes. Alumni and Communications Team — Elizabeth Arnold, Ashley Conrad, Katelynn Hanna, Ashley Koser, AJ Radle, Jeff Ross, Julie Stellfox, John Vitale and Dawn Wooster. 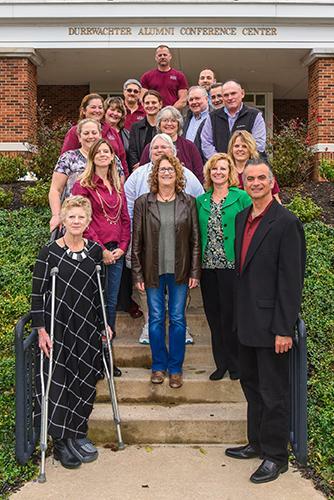 Freshman Commons Task Force — Kathy Allison, Sandy Barney, MaryJo Campana, Katie Ely, Stephen Gitonga, Shonah Hunter, Amy Kutay, Julie Lammel, Meisha McDermit, Beth McMahon, Todd Nesbitt, Christ Offutt, Jeanine Page, Lisa Riede, David Russell, Rick Van Dyke, Nichole Wible and Elsa Winch. The team also includes three students: Michaela Gawrys, Amanda Hall and Ali McCurdy. Raub Hall Chiller Repair Team — Pat Foust, Tony Hayes, Mike Hofer, Bo Miller, Jill Mitchley, Roger Plaisted and Steve Shadle. Assisted by member of the LHU maintenance and grounds crew. Early Alert Team — Valerie Dixon, Amy Downes, Kenny Hall, Kristin Laudenslager, Robin Rockey, George Rusczyk and Chris Stanonis. Five years — Heather Bechtold, Merrill Chapman, Amy Downes, Lucas Fanning, Katherine Fiegel, Lawrence Foust, Angelic Hardy, Kimberly Harris, Darlene Hepler, Tyana Lange, Judith Moore, Stephen Neun, Pamela Ruane and Kristin Vincenzes. Ten years — Darlene Ardary, Terry Blazina, Cheryl Brown, Stacey Davis, Brett Everhart, Kimberly Everhart, Steven Granich, Curtis Grenoble, William Hanelly, Elizabeth Harlowe, Mark Jones, Liza Kopp, Raymond Mantle, Jacinth Maynard, Michael McSkimming, Jeanine Page, Michael Paulus, Kenneth Pittenger, Priya Poehner, Indrajith Senevirathne, Edwin Severn, Jonathan Stout, Christine Taylor, James Walker and Nichole Wible. Fifteen years — Richard Burkett, Michael Cullin, Candace Gibson, Frank Glossner, Mahlon Grass, Elizabeth Gruber, Dolores Hanna, Patricia Lally, Dwayne Marshall, Candace Matthews, Nicole Mosco, Robert Sandow, Karen Seyler, Kelly Shannon, Jodi Smith and Julie Story. Twenty years — Dwayne Allison, David Custer, Claire Frankenberger, Raymond Heffner, Yvette Ingram, Damarys Lopez, Paul Markert, Thomas Miller, Christine Offutt, Constance Reece, Charlene Rich, Lisa Riede, Aaron Russell, Steven Shadle, George Skibba, Anna Mae Smith, Andrew Talbot and Bobbi White. Twenty-five years — Pamela Fisher, Kelly Hibbler, Stephen Hicks and Paula Moore. Thirty years — Joseph Guerriero, Sherry Herritt, Janet Irons, Kimberly Lindsey and Marchal Rote.